Renowned writer Mohd. Abdur Rahaman Khutheibam was honoured with Gopal Sharma Award 2019 for his contribution to Manipuri literature. 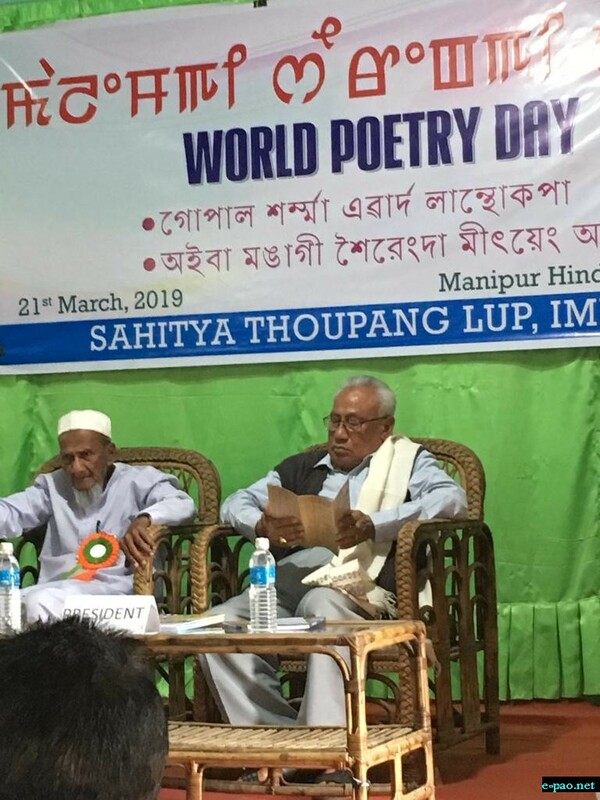 He was conferred the award on March 21, 2019, observed as World Poetry Day, at a function held at Manipur Hindi Parishad Hall, Imphal. President, Manipur Sahitya Parishad, Ibohal Singh Kangjam handed the award to 83 year old Abdur Rahman. The award, instituted by Sahitya Thoupang Lup, in honour of late Gopal Sharma, who started the Poknapham Daily, carries a cash amount of Rs. 20,000, citation and shawl. The works of some of the poets, namely Philip Nikolayev, Robin S Ngangom, Dilip Mayengbam, Wangthoi Khuman and Tongbram Amarjit were analyzed at the function. Abdur Rahman was born on January 2, 1935 at Keikhu, Khetrigao, in Imphal East District, to Mohd. Sifatullah and Yuhra Bibi. His father, Sifatullah, was a dedicated social worker who is credited with establishment of Keikhu Balika LP Madrasa, a girls’ school, in 1946. Abdur Rahman had his early education at Khetrigao LP Madrasa. He was then enrolled in Churachand High School at Imphal for further studies. He cleared Matriculation Exam in 1951 conducted by Gauhati University. He was admitted for I.A. at D.M. College, Imphal, but due to financial constraint he could not complete the course. In 1953, he joined Post Office at Imphal as an employee. Later, he was posted at Jorhat Post Office, Assam. As he was required to be at home, he had to leave the job. He got married in 1954. In 1955, he became a Lower Division Clerk in Agriculture Department under the Government of Manipur. Abdur Rahman followed his father as a social worker from a young age. He was associated with various activities between 1950 and 1960, which include setting up of Ansarul Islam Library, Rural Youth Organization and Child Centre, up-gradation of the Khetrigao ME School to Junior High school and celebration of religious festivals, like Muharram and Milad-ul-Nabi. Abdur Rahman also started writing prose and poetry from an early age. He was also a meticulous researcher. He started publishing his writings, which included poetry and prose, in some of the prominent journals and periodicals, namely Thoudang, Payame Islam, Mingsel, Ritu, etc. o Soklaba Thamoigi Kholao (poetry, 2018). Abdur Rahman also contributed chapters on the history and culture of Muslims in Manipur in some of the books published in English, namely in N. Sanajaoba (edited), Manipur Past and Present, Volume IV and H. Dwijasekhar Sharma (edited), The Other Manipur, Volume V, Part II. He has also presented papers in seminars and conferences. He is associated with Writers’ Union, Manipur and Islamic Cultural and Research Association (ICRA), Imphal. Over the years, Abdur Rahman has been honoured with many awards by various bodies and institutions acknowledging his contribution in enriching Manipuri literature and in promoting Manipuri literature among Muslims in Manipur. The awards are Sahitya Bhusan given by Manipuri Sahitya Parishad (2003), Writer of the Year by Naharol Sahitya Premi Samiti, Imphal (2004), Certificate of Honour for dedication in the field of literature by the State Central Library, Imphal (2009), ICRA Lifetime Achievement Award by ICRA and Writers’ Union, Manipur (2014) and Certificate of Honour by Senior Citizen for Society, Manipur (2014).